It was eight-person girls trip which, yes, was about celebrating my birthday, but also about taking time to just relax, rejuvenate and enjoy the summer. Like I touched on in my previous blog (click here to read), my closest friends have all stemmed from different places in my life. There were some from school, some from uni and even a pal who I visited when she was born (not that I remember – but that’s the general consensus). All with different strengths and personalities, I turn to them at different times of need – and the only time they turn altogether is maybe for the odd hour here and there when I’ve invited them to my birthday in the past. With that said, some had never even met. Don’t get me wrong, I completely believe in my friends and know they’re some of the sweetest and most inclusive people out there – but, I knew if this trip was going to be nothing but pure bliss in the most uncliquey way possible, we had to spend the first day/night bonding. At this point, we’d all been united with matching t-shirts, had enjoyed a quick trip to Byron’s best falafel joint and competed in a gruelling Ninja Warrior competition. But if there’s one thing I’ve learnt about people – if you ever want to really bring them together, give them food! I’ve always envisioned the perfect afternoon with a Moroccan style blanket, cheese platter, wine and watching the sun go down. This to me is pure bliss. So after finally finding my cheesy overpriced yet perfect beach throw, all that was left was the actual cheese! Using Instagram as my main source, I looked around to find the ultimate platter company in Byron. There were heaps of beautiful ones, but only one that really stood out – you could just feel the passion and love that went into each arrangement. I needed Platter Me Beautiful. But I didn’t have my hopes up considering as I was requesting it very last minute. But it was meant to be, with the lovely Ashley responding to my plea and emailing straight back with options. It was such an easy process and she even went above and beyond recommending the perfect beach for us. Might I add, it was the Friday night straight after Ninja Warrior training where we were an hour late, however even with a young toddler at home, she still accommodated us and did not disappoint. The platter was my third and final surprise for the girls after the t-shirts and ninja training. We didn’t get a chance to shower between, only a quick 5 minute wipe down where I confused them more saying: “you’ll want to look good in terms of photos”. With eight of us, two Uber’s were in order – I left promptly in car one and we asked car two to pick up some wine on the way. Standing in the arranged pickup location was Ashley holding the most beautiful platter I’ve ever seen. 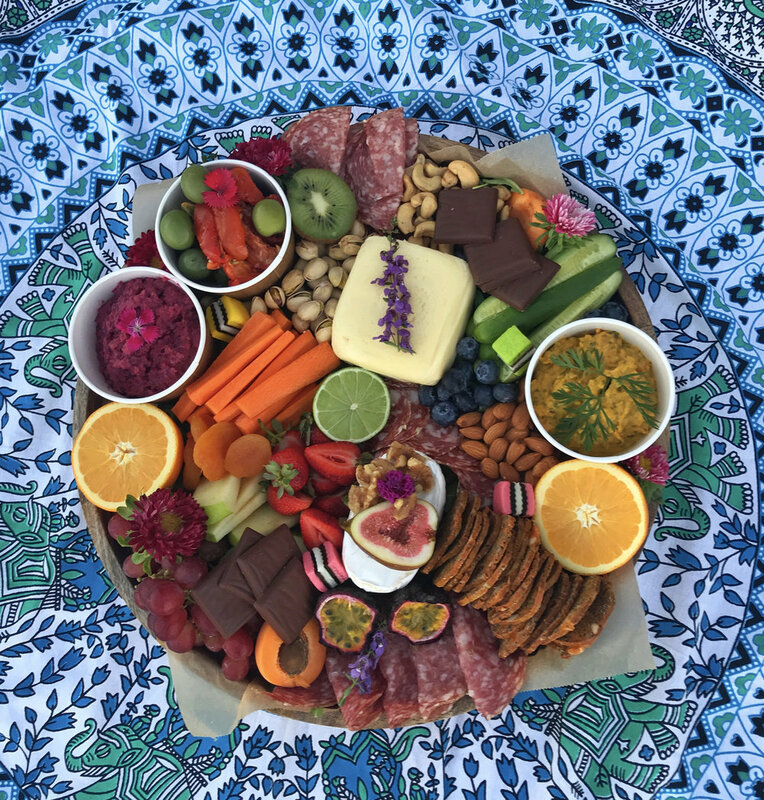 Accommodating to our dairy free and gluten free needs as well, there was everything from selections of cheeses, dips, arrangement of crackers, warm bread, fruits, vegetables, nuts, lollies and even CHOCOLATE! 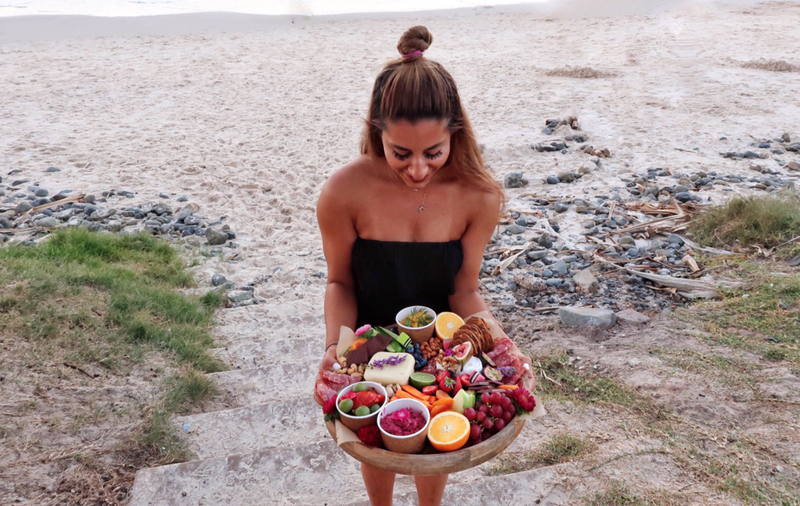 I knew Ashley was the perfect person for the job as soon as I learnt she sourced all her produce from local Byron Bay shops and delicatessens – really supporting that local market. As we were running quite late, it wasn’t long until the sun set. But we still managed to get our many (many) photos and honestly devoured every last bit (including the flowers and limes) it in 20 minutes. I was right, there’s no better way to break the ice and get people to know each other than to give them food! Even the clean-up process was as simple. We took the board and knives back to our places, gave them a little wash through and left them outside where Ashley came round and picked it up first thing in the morning – nothing but ease in the most seamless way. Whether it’s just for your loved one, a girl’s trip or a wedding party, Ashley can cater and I recommend you giving her a call. A platter is the perfect way to celebrate, relax and bond with someone and I could not have wished for a better experience.